If the replacement of the G7 by the G20 as the major forum for discussion of international economic governance in 2008 had marked the acknowledgement of multipolarity in an economic sense, recent events have forced upon the US and the West a long overdue acknowledgement of geopolitical multipolarity. The Antalya G20 summit has been overshadowed by the 13 November carnage in Paris and the Vienna meeting of the International Syria Support Group the next day which announced a common if shaky framework to end the conflict in Syria. If the Antalya Summit was reported at all, it was mostly to note that the West had finally been forced to acknowledge that President Putin could no longer be treated as an “outcast” and had to be regarded as a “problem solver” in the Middle Eastern and specifically the Syrian situation. 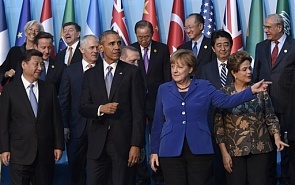 Major world leaders, including President Obama, sought to confer with him on the sidelines of the official meetings. Clearly, the Russian intervention in Syria, though it exacted a terrible price in the downing of the Metrojet airliner, is being vindicated. Ironically, however, the very events that overshadowed the G20’s Antalya summit reinforced the transition in world affairs that the grouping represents. If the replacement of the G7 by the G20 as the major forum for discussion of international economic governance in 2008 had marked the acknowledgement of multipolarity in an economic sense, recent events have forced upon the US and the West a long overdue acknowledgement of geopolitical multipolarity. Geoeconomically, multipolarity became a public fact in 2008.The spread of productive power and the emergence of the BRICS, set against the background of an economic crash that was generated in, and for the most part confined to, the so-called ‘developed world’, signaled as well as hastened the new economic reality. Now, this reality is imposing itself on politics, and geopolitical multipolarity is finally reversing the US’s and the West’s decades-long violation of the sovereignty of less powerful countries under the guise of ‘humanitarian intervention’, ‘democracy promotion’ and ‘responsibility to protect’. The purpose of such post-Cold War interventions remained much the same as they had been during the Cold War: to preserve Western dominance, including by doing everything possible (and as the existence of Actually Existing Communism showed, it was not always enough) to prevent other countries from achieving the productive or economic power that could help them challenge the West’s geopolitical dominance. Now, the shift in the balance of economic power has dramatically asserted its ascendancy in the political sphere in the most dramatic possible manner: a public humiliation of a US leadership forced to recognize, at least for the time being, the new realities of the Middle East a scant week after Defence Secretary Ash Carter declared Russia and China to be the main threat to the world order, taking second place to ISIS. On the face of it, the Paris attacks did not change much. As was to be expected, they led to a chorus of righteous outrage across western capitals accompanied by the continuation of the deliberately ineffective bombing campaigns which, for more than a year, the West has been conducting in Syria, ‘failing’ to stop ISIS in its tracks (or better, perhaps, failing to topple the Syrian government). President Hollande declared that France was ‘at war’ (it was in fact at war long before the Paris attacks) and proceeded to execute airstrikes against Raqqa, deemed the headquarters of ISIS in Syria, in a largely symbolic move. Given the dangerously trigger-happy discourse that continues to dominate the West, President Obama’s understandable hesitation to commit some flamboyantly violent act of solidarity with the French had the media practically baying for immediate intensification of US military intervention. New waves of Islamophobia swept across the Western world, complete with many governors of US states refusing to take in Syrian refugees. However, underlying these surface appearances, much had changed decisively. It was not Paris events themselves that changed things: rather the maturation of deeper and longer developments was made visible in their explosive light. Western double standards have increasingly been questioned, so much so that even on the very morrow of the Paris attacks, in stark contrast with the ‘je suis Charlie’ solidarity of January, the mainstream media had to admit that the Paris attacks, tragic and horrific as they were, needed to be put in a larger perspective of attacks on innocent civilians across the (chiefly non-western) world including in Lebanon, Turkey and in the war torn countries of Syrian and Iraq themselves. As the initial shock abated a little, serious questions emerged about the sort of security failures that would have permitted Paris to be the site of even worse terrorist attack less than a year after that on Charlie Hebdo. Policy- and opinion-makers have also had to acknowledge that Western strategy in Syria had not merely failed, but failed because of the bad faith of its objective: the removal of Assad having enjoyed a higher priority than the war on ISIS. Vienna reversed this, recognizing that only within the institutions of a sovereign state would meaningful political change, including democracy, could be attempted. Inevitably, the US strategy led it to play off ISIS and related jihadist groups against the Assad regime, turning a blind eye to its growth, actively contributing to the supply of arms and finance which gave it sustenance, and working systematically to undermine the military capacity of the Syrian state, the only bulwark against ISIS. The new Liberal Canadian government’s commitment to withdrawing from aerial bombardment, a commitment that has stood firm despite the Paris events, provided early recognition that this strategy was failing. And along with that came the realization that the Russian strategy of supporting the Syrian state against ISIS had considerable merit and the Russian insistence that any peace negotiations include Syrian President Assad is valid after all, that no peace is possible without it. Now, even President Hollande appears set to engage in ‘shuttle diplomacy’ between Moscow and Washington (the return of this Cold War practice is not accidental: that was also a time when there was some check on Western and US power) to seek to build an international coalition against ISIS. Further evidence of the untenability of US strategy is the continuing failure of the Cameron government to secure public support for UK intervention. The vilification of new Labour leader, Jeremy Corbyn, hides the fundamental fact that only 25% of the British people support interventionthat the Conservative party itself would be unable to prevent its own MPs breaking ranks on this issue. As other such developments unfold – such as the letter from four US air force servicemen testifying to the failure as well as moral bankruptcy of the US’s aerial bombardment strategy– the possibilities for ending the tragic Syrian conflict are widening. It is imperative that non-western powers, preeminently Russia, exploit these possibilities fully and responsibly. If there is one thing that the multipolarity that they represent can achieve, it is to restore the historic achievement of the post war period – respect for sovereignty and international law – which the hubristic West has done so much to erode in the past quarter century. Squandering this opportunity in pursuit of narrower interests would not just be tragic: it would play into the hands of the West which can only benefit from any practical or legitimacy deficits in the actions of non-western powers. Conversely, in arriving at any such broad-based settlement, non-western countries must also be wary: while the West’s failures has prodded it to seek the cooperation of non-western powers, it will take a lot, and a lot longer, before the deeper impulses that power its foreign policy can be expected to change.